She’s big, pink and fabulous! 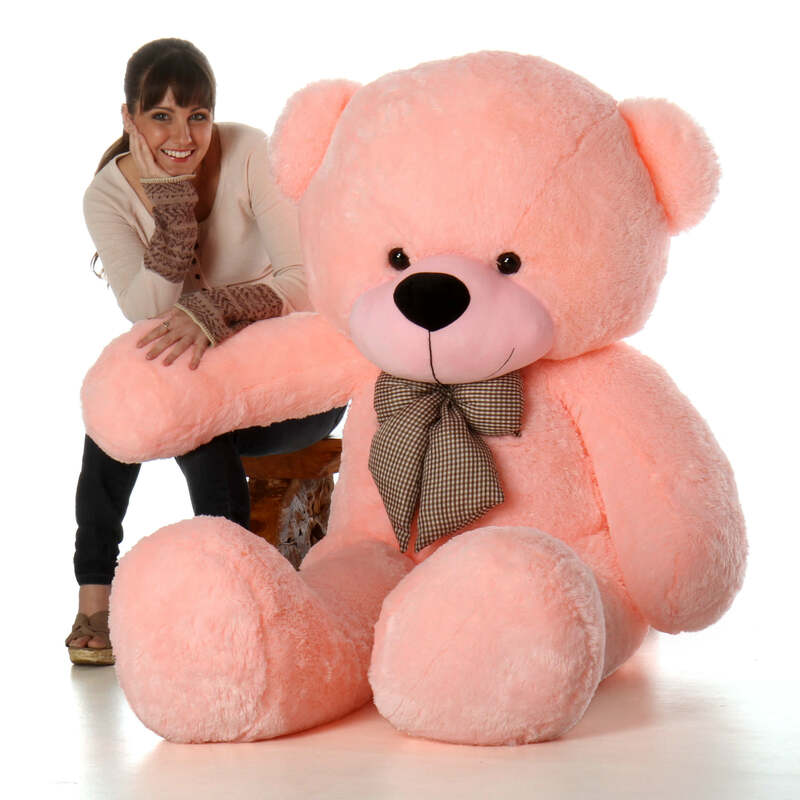 Lady Cuddles is a huge, oversized 6-foot teddy bear that will be the gift of a lifetime for some special person you know. She is adorably sweet and so soft and cuddly with beautiful pink fur - you just have to hug her the minute you see her. Lady has a big, soft black nose, lovely brown teddy bear eyes, and a cute brown and white checked scarf that you can remove. She is stuffed with love in California with materials that are never recycled! Giant Teddy brand bears are the softest teddy bears in the world, and once you’ve hugged one, you’ll never want to let go. Our bears are safe for people of all ages and must meet or exceed all US Safety Standards…and pass our own Huggably Cute test. Lady Cuddles makes a wonderful Life-size Valentine’s Day Teddy Bear gift and is the perfect choice anytime you want to impress someone who loves all things pink. How BIG is Lady Cuddles? Giant Teddy makes some of the world’s biggest teddy bears, and we carefully balance giant size with total quality and extreme cuteness. This huge stuffed teddy bear is 6 feet tall and will be the gift of a lifetime. 72in Lady Cuddles is the same height as a person who is 6 feet tall, but she is much bigger overall with a huge teddy bear head and a big plump bear body with large arms and legs. How Fast Will Lady Cuddles Arrive? We make it easy to order oversized teddy bears online, delivered to your door with FREE SHIPPING in the 48 Continental U.S. states. Please allow 4 to 6 business days for Free Shipping. You can see our delivery map for estimated Bear Travel Time to your shipping location, or use the “Estimate Shipping & Tax” tool once you place an item in your shopping cart. All available Shipping Options based on your delivery zip code will be shown while you are checking out. Want to send a Giant Teddy somewhere outside the US 48? See our Shipping Page for information or use the “Estimate Shipping & Tax” tool in the shopping cart to see what options we offer for your shipping destination’s zip code, postal code and country. How Will Lady Cuddles Travel? All of our Giant Teddy bears travel to you in cardboard box with the Giant Teddy logo on the side, delivered directly to your door. If you need a plain cardboard box for a “surprise gift” please tell us in the order comments section. All Giant Teddy bears over 4 feet tall arrive in a vacuum-sealed bag inside the box. Open carefully and watch your bear grow to life-size! Does 6 ft Lady Cuddles come in other colors? Have more questions about the Giant Teddy brand, our bears or our warranty? It was honestly an amazing feeling when my Valentine got to see this amazing 6ft bear! She loves it! I was trying to figure out a way to send a big hug to my sister who had just started chemo therapy for breast cancer. I googled large teddy bears and your site came up so I thought I would give it a try. When I say it far exceeded my expectations that would be an understatement. She was completely blown away. She is in love with her new friend and he received about 200 likes on FB! Thank you for creating a product that made her smile! I got this for my nieces Champaign birthday (3 Years Old). She absolutely loved it. Extremely cuddly and soft and well proportioned. The box it came in did not make it though. When I received it, the vacuum sealed bag had broke and the bear was expanding to the point where the box began to break. but nothing some box tape and TLC cant fix. Came in exactly 6 business days after purchase. Got tracking updates the whole way through, also with giant teddy emailing me when the item was on its way and also when it was delivered. All in all, a great buy and great experience but most importantly a great gift! Cutest thing in the whole wide world!!! Super fluffy, soft and maximum level of being adorable!! Love this bear and you'll not regret about getting it! You'll always want to hug it anytime and cuddle on it. O U T S T A N D I N G !!!!!!!!! The teddy was sent to Kansas, it arrived when you said it would. It was a gift and they loved it. I was very happy with your company and will use you again in the future. I was 100% satisfied with the service, and my girlfriend was 100% satisfied with the gift. Delivered on time and to my specifications as a surprise gift. Great company and Great products. Shaggy Cuddles Soft and Huggable Giant Amber Teddy Bear 72in - The Biggest Teddy Bear!